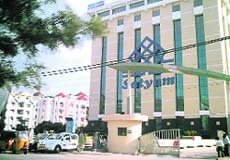 The stake sale process of Satyam Computer reaches the final stage tomorrow, with the government-appointed board set to conduct financial bidding to select the highest bidder. Indian stocks continued their recent ascent, fuelled mainly by optimism about US government’s plans to unfreeze the credit markets. The G-20 group’s move to spend $ 1 trillion for reviving the global economy also added fuel to the fire. ; The Bihar High Court has ruled that health supplements marketed by various drug companies should be treated as food, not as drugs, as was being done at present. In India, drug companies have registered the health supplements as drugs in some states and as food in others to evade taxes. Foreign institutional investors, who had turned away from the Indian equity market last year, seem to be returning back as since the beginning of the new financial year 2009-10 they have already put in over Rs 1,000 crore into the domestic stocks. "We have entered the final stage of the bidding process, and on Monday we will conduct the financial bidding in Mumbai to find the highest bidder for a 31 per cent stake in Satyam Computer," Satyam board chairman Kiran Karnik told PTI. He said interested parties can submit bids till 9 am on Monday, after which the technical evaluation of bid will be held first, followed by the opening of the financial bids. "If there is a party with a 10 per cent difference with the top bidder, this will go for an open auction. Otherwise, the top bidder will be announced as the winner," Karnik said. "We hope by weekend, the transfer of management would happen as we would recommend to CLB on Wednesday our decision on the highest bidder. It may take a day or two for the CLB to approve the new investor," Karnik said. Engineering major, Larsen & Toubro is believed to be the front-runner in the race for the beleagured IT-company, while Tech Mahindra and Private-equity firm, W L Ross are also active in the fray. Nasdaq-listed Cognizant Technology Solutions is understood to be in the race in an "arrangement" with private equity firm Wilbur Ross. Karnik said during the bidding, board members Deepak Parekh and SB Mainak may not participate in the proceedings if the bidders happen to be those companies in which they or their companies are on the board. While Parekh is on the board of Mahindra & Mahindra (parent company of Tech Mahindra, a probable bidder), Mainak's company LIC is a major shareholder in L&T, which is also in the fray. The bidders were till the last moment seeking clarity on the company's financials, law suits and H1B visa holders, Karnik said. "Satyam has a substantial H1B visa holders," he said without giving numbers. When asked if Spice group has approached the board for entering the fray, Karnik said: "We have responded to their concerns." Former Supreme Court Chief Justice S P Bharucha, who has been appointed by the Company Law Board will oversee the sale process. This was fifth straight week of gains for the markets. The BSE Sensex has climbed 32 per cent from a low of 8,160 on March 9. The rally has lifted the market to positive territory this year after it had plunged 52 per cent in the last calendar year. The Sensex gained 455 points to close the last week at 10,803, a six-month high and Nifty jumped 131 points to settle at 3,342. Falling inflation was another booster for the market besides positive global cues. Inflation dipped slightly in the last week of March to 0.26 per cent than previous week’s 0.31 per cent. Going forward, the market may extend gains on the back of buying by foreign funds and expectations of a further easing of the monetary policy by the central bank, but investors may exercise caution ahead of the Lok Sabha elections and announcement of corporate earnings. The volatility is expected to high. Investors with a three-year horizon may buy into the stock of Shanti Gears around the current price of Rs 30. The investment rationale for the stock, besides the pick in the demand that would ensue on the back of improvement of the economic scenario in the country, we like company’s strong focus on profitability, clear focus on its core competencies and company’s culture of changing with the changing environment. The risk to the recommendation is longer than anticipated slowdown in the industry. SGL is a Coimbatore-based industrial gear manufacturing company and is in existence for more than three decades. The company, which earlier had a forte in manufacturing gears for textile machinery, is now producing gears for industries as wide as process, power, steel, cement, sugar and aviation. Most importantly, SGL has the capacity to design as per the customer’s requirements. Customised products contribute around 60 per cent of its revenues. It has its own wind mills with capacity of 5.16 MW, which makes it almost self-sufficient in its power requirements. The company has upgraded its manufacturing capabilities to high-end gear boxes for windmills, gear boxes for rolling mills, gears for aviation and defence helicopters. SGL supplies standard as well as custom-made gears and gear boxes to its clients, which include high-profile and respectable names like Tata Steel, BHEL, ACC, Hindustan Aeronautics, Siemens, Mitsubishi and Rolls Royce. In fact, SGL is the only listed manufacturer of gears for helicopters and light combat aircraft to Hindustan Aeronautics Ltd.
Investments under way and planned in sectors like power, cement and steel lend good visibility to the company’s prospects. ;The Bihar High Court has ruled that health supplements marketed by various drug companies should be treated as food, not as drugs, as was being done at present. In India, drug companies have registered the health supplements as drugs in some states and as food in others to evade taxes. The court’s verdict was based on the findings of a expert committee headed by Director General of Health Services (DGHS) and is binding on all states in the country. According to the court order, following products would be treated as food supplements: Ferradol, manufactured by Pfizer Ltd, Revital manufactured by Ranbaxy Laboratories, A to Z manufactured by Alkem Laboratories, Beneficial capsules, CSN capsules and DSN capsules manufactured by Shreya life Sciences and other products like Zencovit plus, Glucose C, Vimpro plus, Promac powder, Hemplus, Samvita, Samdol, Proteinmix etc. The court has stated that these products are food supplements and have no therapeutic claims on the label to suggest that it could treat, prevent, cure or mitigate diseases, hence it should not come under the definition of drugs and should be treated as food supplement. The most interesting part of the case is that Bihar State Drug Controller had challenged the matter stating that the decision of DGHS is vitiated as it has consulted only authorities under the Food Act but has not consulted authorities under the Drugs Act. It also raised a plea that once the companies have registered the product as drugs, they can now not be treated as anything, but drugs. The court has quashed the above objection and stated that all drug controlling authorities from different states, including Bihar, were included in deliberations by the DGHS. The court also stated that once the company has registered the product under the drug licence it can correct its stand. The matter came up in the Bihar High Court because during an inspection conducted in the godown of Ranbaxy Laboratories in Patna, the company was directed not to sell some products without licences under the Drugs Act. The Bihar State Drug Controller was of the view that food supplements having been accepted as food in Bihar, were in other states being manufactured as drugs. Hence the storage and marketing of these commodities without drug licence was prohibited in the state of Bihar. FIIs seem to have embarked on fresh buying mode and made net investments of Rs 1,056.1 crore since April 1, the latest data available with the market regulator SEBI website shows. Significantly, in last fiscal, FIIs had pulled out close to Rs 50,000 crore at the domestic stock market, almost equaling the inflow in the previous financial year. According to SEBI data, FIIs' net outflows have been Rs 47,706.2 crore till March 30 in the financial year 2008-09 as against huge inflows of Rs 53,000 crore in FY'08. Further, the Bombay Stock Exchange's benchmark index Sensex has witnessed a rally in the past two weeks although the trading sessions have been just five due to holidays in between. Since the beginning of the new financial year, Sensex has gained over 900 points or over 9 per cent. On Thursday, the last trading day of the week, Sensex closed at 10,803.86 points. Besides, FIIs have also made net investments in the debt segment to the tune of Rs 620 crore in the first five days of the FY10. Interestingly, it seems that domestic mutual fund houses are still concerned about the movement of the equity market as they have been net investors of just Rs 38.3 crore in this fiscal, the latest data available with SEBI shows. However, fund houses have put in significantly more amount in the debt segment in the first few days of the fiscal year.They have made investments of nearly Rs 9,000 crore in the debt segment in April so far, the latest data shows. Q. With reference to your reply to Neelam Bhatia’s query published in The Tribune dated 22.12.2008, you are requested to clarify whether family pension is divisible amongst all legal heirs of the deceased even if some of them are not eligible to get family pension under the Pension Rules. What will be the tax liability? A. Family pension of a person forms part of his estate and should, therefore, be divisible amongst the legal heirs of the deceased. Pension rules may have a provision to provide the name of the person who would be entitled to receive such pension after the death of a person entitled to such family pension. This aspect should, therefore have a limited application with regard to the receipt of pension. As to how the same is to be shared between the legal heirs, in my opinion cannot be prescribed by the Rules with regard to the grant of pension. Q. If somebody has income only in the form of bank interest for AY 2004-2005 and TDS is deducted and return is filed in October 2007 when net income becomes below taxable limit after 80L, is the person eligible for refund now. 2) My son was a lecturer in a college at Jalandhar up to 31/7/2008 and joined an institute at Chandigarh on 1/8/2008. Will he file the return for AY 2009 -2010 at Jalandhar or Chandigarh, though he had been filing returns at Jalandhar previously and of course he will file at Chandigarh for the AY 2010-2011. A. (i) The income-tax return for assessment year 2004-05 could have been filed by 31st March 2006. The return having been filed in 2007 would not be a valid return and it may not be possible to claim the refund of income-tax on the basis of a return filed in the year 2007 in respect of the assessment year 2004-05. (ii)Your son can file his return at a place where he has his permanent residence. Q. My total income from all sources works out at Rs 3,44,299. Please calculate the tax on the said income. A. The total tax payable would work out at Rs16,851/- (16,360 + 491) in your case on which an interest under Section 234C of the Income-tax Act 1961 (the Act) would be chargeable. The chargeable interest would work out at Rs 621 as no advance tax instalments have been paid during the year. In case you have deposited this tax before 31st March 2009, no interest would be chargeable under Section 234B of the Act. Q.	I have an income of Rs.4,80,000. Can I invest Rs 1 lakh in tax-saving scheme. Kindly calculate my income-tax to deposit. A. In case you are a senior citizen, the tax payable by you on an income of Rs 3,80,000 would be Rs.24,205, including the surcharge for education cess @ 3%. In case you are not a senior citizen, the tax payable on the aforesaid income would be Rs.31,930, including the surcharge for education cess @ 3% thereon. Q.	I want to apply for permanent account no. in the form 49A. Ours is a society registered under Societies Registration Act. Our society is formed for the purpose of helping weaker and economically backward sections of society. I want to know what will be the status of my society while filling PAN form 49A. On what status I have to tick in form 49A. I am confused between AOP (association of persons) & AOP (trusts). Also, for income tax exemption purposes which is available to trusts, will assessing officer check PAN no. whether it is of AOP or AOP (trusts). Please advise. a) The status of your society would be AOP. There is no separate status as AOP (Trusts). The word ‘Trust’ is possibly added so as to indicate that an association of persons is in the form of a Trust. b) The status for claiming the exemption from income tax would also remain AOP. The Permanent Account Number as allotted to the society will have to be mentioned while filing the return of income of the society.